New in version 10 - Auto Email, you can Say it and then Mail it. (No need to tap the Send button). 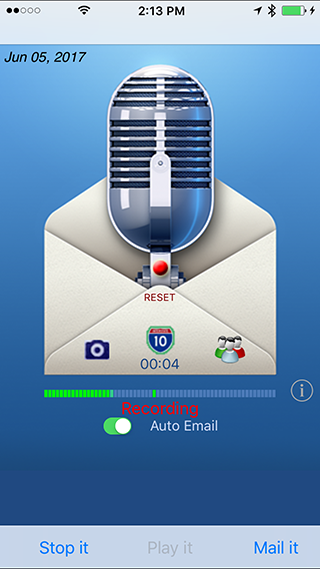 Record and email voice memos using your iPhone, iPad or iPod Touch. Use it to email reminders to yourself or email messages to anyone. Version 10 is available now. 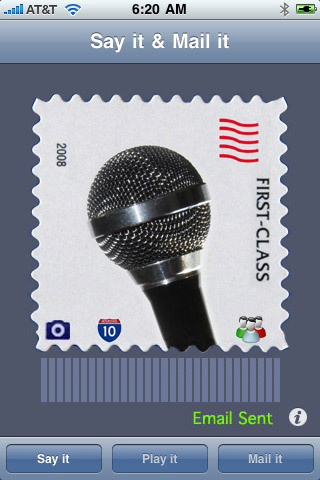 The quickest way to email a voice memo from your iPhone or iPod Touch to yourself or to others. Proximity Recording - You can hold the iPhone to your ear and speak. When you move the iPhone away, recording stops and the email window opens. 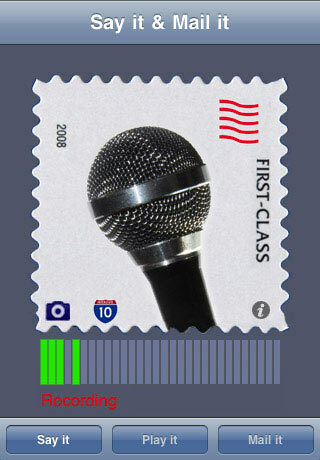 Tap on the microphone - You can tap on the microphone to start and stop recording. 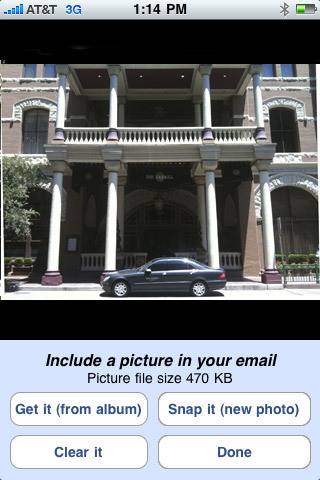 Speech to Text with iPhone 4S or later - You can convert your voice memos to text. Shake it & Mail it - You can shake your iPhone or iPod touch to start and stop recording. Then just one tap to email yourself a voice memo. 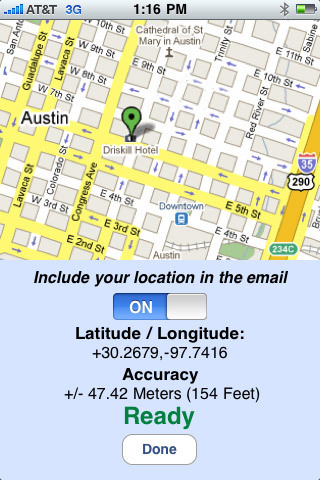 Note: for your privacy, map location services will not be used until the location switch is on. Supports VoiceOver for the visually impaired or Blind. Record bird songs . Hear a bird singing, record the sound, then email it along with the map location and a photo. Emailed voice memos are compatible with Mac, PC and any other computer O/S (uses compressed wave format). No file maintenance on your iPhone/iPod Touch, since audio files are not stored there. Don’t you wish you could find just one app from among the thousands out there, that works fast, is dead easy to use and actually does everything it claims to? ‘Say it & Mail it’ is an extraordinary communication tool. 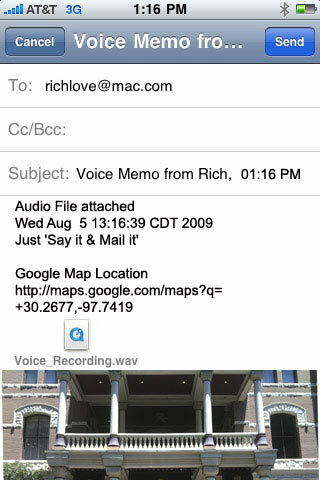 With ‘Say it & Mail it’, you can record your voice message or memo, attach a Google Map link and photo or movie. All the components of your message are sent together in one easy, complete email. If you are using an iPhone, your message is sent off immediately, thanks to cell towers. iPod Touch devices store the email or memo and send as soon as they are able to make a Wi-Fi connection. ‘Say it & Mail it’ has a wonderful autofill feature to take care of filling in email or email group addresses and subject line for you. No typing, just tapping – once to record (Say it), one more time (Mail it) and then tap Send once you’ve selected the recipient. You never have to clean up files with ‘Say it & Mail it’, either. The audio files are not stored on your handheld device; you just send and forget about it. Didn’t we tell you that it was easy? Email sent from ‘Say it & Mail it’ is compatible with all computer operating systems, so there’s never a concern about incompatibility. There are no ads in this app, either. It has a nice, clean interface and is exactly what it’s suppose to be – a quick, easy, versatile communication app. So, what can you do with ‘Say it & Mail it’? Lots of things! •	And a whole lot more! People from many different professions and walks of life make daily use of ‘Say it & Mail it’. It makes their job and life a lot easier. They can photograph and map locations, objects or events to share or promote, and can memo themselves information or reminders for a project. All of these people can’t be wrong. 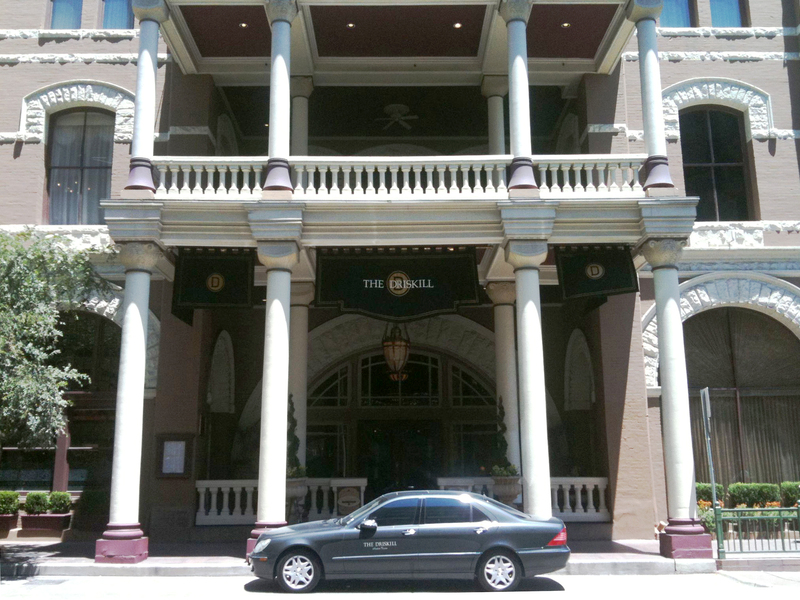 We invite you to read what they have to say about us in the reviews, if you’re not sure. You’ll find that it’s true – ‘Say it & Mail it’ is one app that does exactly what it claims to. Join the crowd and make your life and communications easier. Buy your ‘Say it & Mail it’ app today. iPod Touch, Google Maps, Pictures, Photos, audio, video. Sample Screenshots from "Say it & Mail it"
Click on the photo to see the full size picture that is included in the email. 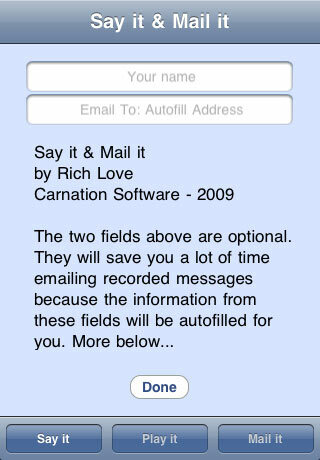 Say it & Mail itrecords and emails voice messages from your iPhone or iPod Touch to yourself or to others. Code Sleuth searches for Mac errors with your iPhone or iPod Touch. Finds Mac error codes and searches with Google for solutions. MacWise, our terminal emulation program, was written specifically for Mac OS X. Carnation Software has been providing Macintosh terminal emulation since 1989. We specialize in terminal emulations for Wyse 50, Wyse 60, Wyse 370, ADDS Viewpoint, Esprit, Televideo 925, DEC VT100, VT220 and Prism - connecting Macs to host computers. Copyright 2009 - 2012, Carnation Software. All Rights Reserved.